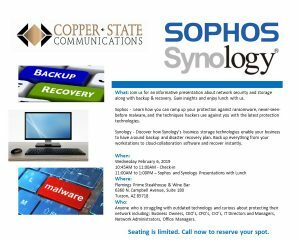 Below is an invite for all business owners in the State of Arizona or heads of Operations or Information Technology Departments directors, CEOs, CIOs to attend Copper-State Communications very first Sophos and Synology Lunch & Learn being held in Tucson on Wednesday 2.6.19 at Flemings Prime Steakhouse & Wine Bar. Admission: FREE for all attendees. rarevalo@copper-state.com | Main: 520.795.1877 | Desk/Cell: 520.318.6338.